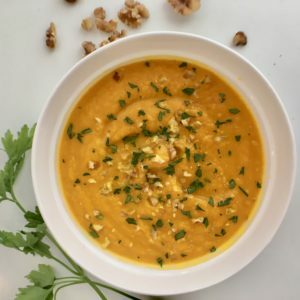 Simple and filling soup perfect for any season. Heat avocado oil over medium heat in a large (6-8 quart) pot. Add diced onions. Saute in avocado oil until translucent. Add carrots, ginger, cumin, cinnamon, and turmeric. Stir thoroughly. Add 6 cups of broth and 1/2 tsp sea salt. Increase heat to medium high. Cook until carrots are tender (about 20 minutes). In batches (no more than 2/3 full), blend liquid broth & carrots in blender or food processor. Blend eat batch until very smooth. Add additional liquid, if needed, to reach desired consistency. Return to pot to reheat slowly. Add spritz of Meyer Lemon & sea salt to taste. Serve topped with parsley, chopped walnuts, and/or avocado.